i worked so hard on my last blog. did you like it? sometimes i can't tell because a ton of people will look at my blog but no one will comment. i'm still new at this so i guess that's how it goes? i've been struggling with the purpose of my blog lately. originally it was created to be a resource for the people interested in previewing my wedding invitations without having to meet up with me. then slowly i started adding the little crafts i would make here and there, because those are totally related to my invitation business, right? i thought so, you know... it's all creative... or something. lately i've been wanting to add more personal stuff; pictures of my kids, things my family does around town, stuff that's on my mind. but i'm not sure how true to the original thought i should stick to or just be myself and put what i want. hmmm. when my parents were here a couple weekends ago we stumbled upon the cutest ice cream shop in downtown Clovis and totally fell in love. the inside of the shop is decorated with retro red diner chairs and black and white checkered flooring. i failed to get any pictures of the inside (cause there were other people in it and i didn't want to look like a freak taking pictures of the floor and chairs.) but other than the cute decor it had THE BEST ICE CREAM ever. EVER. it's Fresno State ice cream. and dang it's good. Fresno State has an agricultural department because there are a ton of farms out here. they have a dairy farm and everything. well, i guess they make their own ice cream and shops around town sell it. it is so good and creamy and their flavors are amazing. the green one is pistachio (mine), the blue one is bubble gum (big A's), the orange/pink is rainbow sherbet (not Fresno State and it was little a's) and the one in back is a mix of cookie's and cream, coconut, and toasted almond (???) (my Mr.'s). the pistachio was RIDICULOUS! apparently, big A liked his. when i was little bubble gum used to be my favorite ice cream flavor. i would spit all the gum balls out onto a napkin and save them for the end. my Mr. said he would just chew them up and swallow them with his ice cream. big A is just like his daddy. he saved one for the end and ate the gum with each bite. we tried to have the kids take pictures of us, it turned pretty good. my Mr. looks like he's about to wipe my daughter's face in her picture. i just look confused. 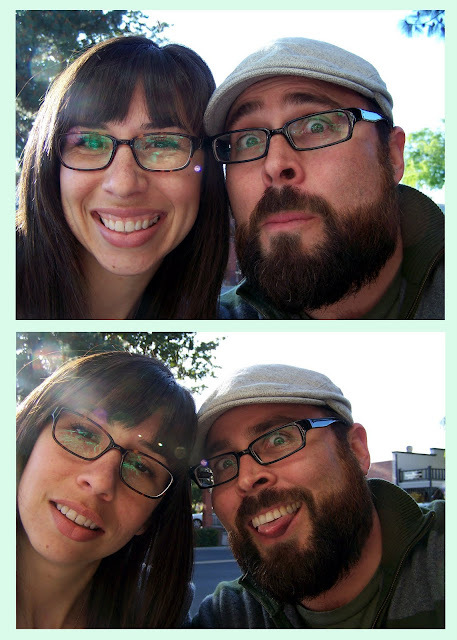 me, "come on honey, let's do a cute one. it's for my blog. i love family dates. 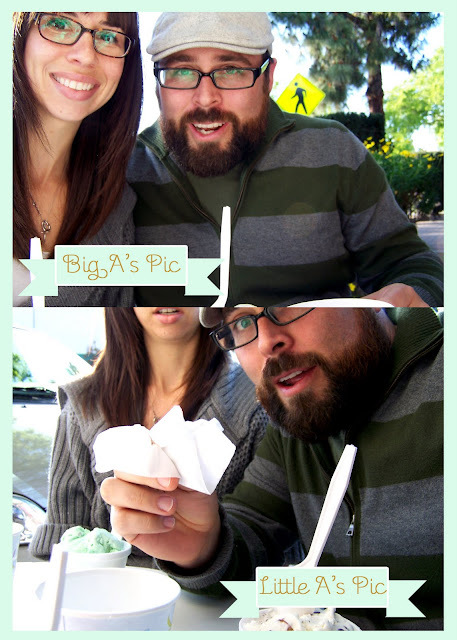 especially when it involves good ice cream, good weather, and silly pictures. so to all 33 of my best friends followers, what do you think? do you think i should stick solely to my design stuff for this blog and start a separate personal blog? should i just not include any personal stuff at all? what would you like to see more of? i love your blog with it all mixed in one. if people want to see only your invitations they can go to the "invitations" catagory of your blog. don't change a thing. it is perfect. one of your blog stalkers. I think as one of your first followers I like it all mixed into one. Who you are is so important. I even like reading strangersr blogs. Besides,who would want to read the just business one without all the personal stuff? If you are serious about your business, then you need a separate blog and website for your invites! Also, I thought your last post was great. That inspiration board must have taken a long time to create! I will try to comment more. It feels nice to have your work appreciated. Keep up the good work, my friend!